Germany unleashed its massive invasion of Russia in 1941, conquering swathes of enemy territory. However, as the first winter snows fell, the Wehrmacht realised it had perhaps bitten off more than it could chew. Unfortunately, due to sales rights restrictions, we cannot offer Operation Blau for sale in your country. Germany unleashed its massive invasion of Russia in 1941, conquering swathes of enemy territory. However, as the first winter snows fell, the Wehrmacht realised it had perhaps bitten off more than it could chew. However, as summer rolled around in 1942, the German Army in southern Russia sought to reach the Volga River, capture a city called Stalingrad and occupy the Caucasus to cut off oil supplies. 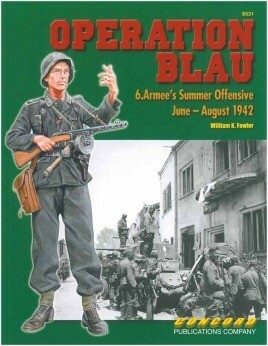 This offensive was codenamed ‘Operation Blau’ and author William Fowler has done a superb job of collating photos relating to this summer campaign. The volume begins with a description of the Eastern Front strategic context and the objectives of Operation Blau. A primary combat unit employed was the 6th Army commanded by General Frederick von Paulus. This formation contained 20 divisions: 250,000 soldiers, 500 tanks and 7,000 artillery pieces/mortars. The author also provides a useful order of battle. Despite facing strong resistance, by late July 1942 the 6th Army was poised near Stalingrad and confident of victory. Of course, history tells us the rest, but that’s beyond the scope of this volume. This book, through the extensive collection of photos, traces the exploits of soldiers as they put Operation Blau into effect. The black and white pictures show all manner of equipment and weapons, with even some Russian equipment thrown in for good effect. In the center of the book is the expected set of four colour plates. The artwork has been prepared by Ramiro Bujeiro, a new contributor to the series, and they show three infantrymen plus a Luftwaffe artilleryman in various uniform combinations. This well-illustrated book offers an insight into an important phase of WWII.